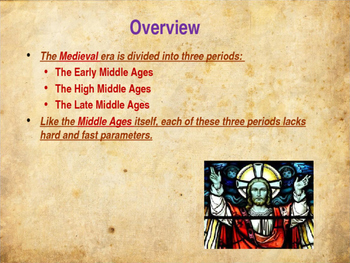 This is a 23 slide, highly animated, power point presentation on The Late Middle Ages. All the slides are editable so you can modify the slides if you need to. 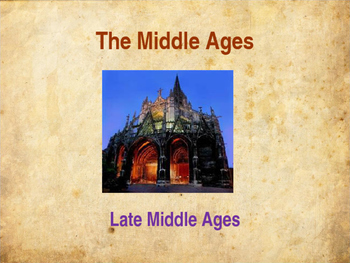 The end of the Middle Ages can be characterized as a transformation from the medieval world to the early modern one. 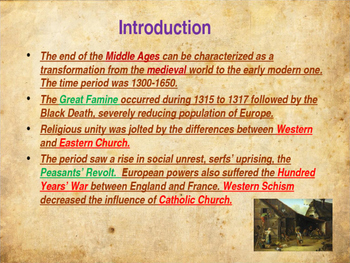 The time period was 1300-1650. The Great Famine occurred during 1315 to 1317 followed by the Black Death, severely reducing population of Europe. Religious unity was jolted by the differences between Western and Eastern Church. The period saw a rise in social unrest, serfs’ uprising, the Peasants’ Revolt. 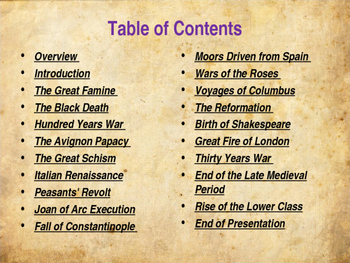 European powers also suffered the Hundred Years’ War between England and France. Western Schism decreased the influence of Catholic Church. Though famine and disease had always been a lurking presence, the Late Medieval era saw the horrific results of both in abundance. The Black Death, preceded by famine and overpopulation, wiped out at least a third of Europe and marked the end of the prosperity that had characterized the high medieval era. The Church, once so highly respected by the general populace, suffered reduced status when some of its priests refused to minister to the dying during the plague, and sparked resentment when it enjoyed enormous profits in bequests from plague victims.